The basic stock market seasonal pattern is after a weak Jan / Feb, strong March / April, a peak in May, down into June, a Strong July / August peaking in Sept for a wobble into October that sets the scene for a strong rally into the end of the year. Well mostly for 2018 that's not how things played out for the market, most notable of which was the FAILURE of the santa rally to materialise. So far 2019 is also not proving reliable in terms of past seasonal trends which implies were more likely to see the OPPOSITE! i.e. a WEAK March and a strong September. What about Santa? Well since he failed to appear last year then ironically would make a santa rally more probable this year. 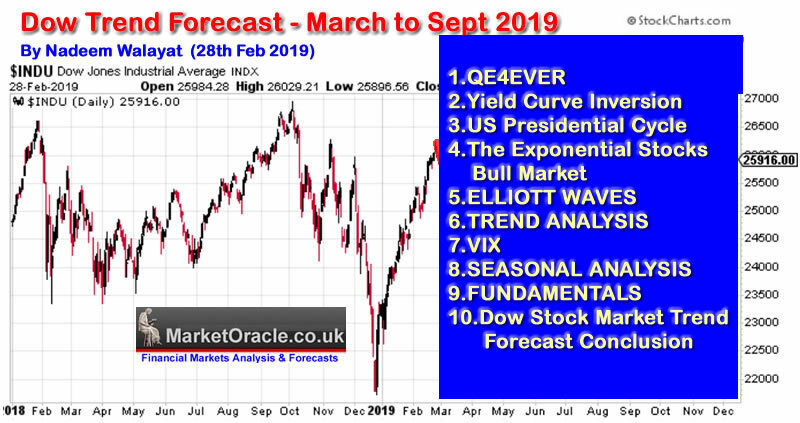 The next analysis in this series will take a look at US Economic Fundamentals in the countdown to my detailed trend forecast for the Stock Market covering the next 6 months to September 2019.